You never know what crazy marketing concept you're going to run into in the macro world. These gigantic companies will lean on just about any angle that will help them sell beer that is, shall we say, not quite up to snuff. So I shouldn't have been surprised when I ran into a Rainier Jubilee display the other day at Fred Meyer. It looked vaguely similar to a display you might see for a seasonal craft beer. These are some fancy cans, for sure. They catch your eye as you shuffle by. You might expect to find a unique seasonal beverage inside them, but that's where you would be dead wrong. 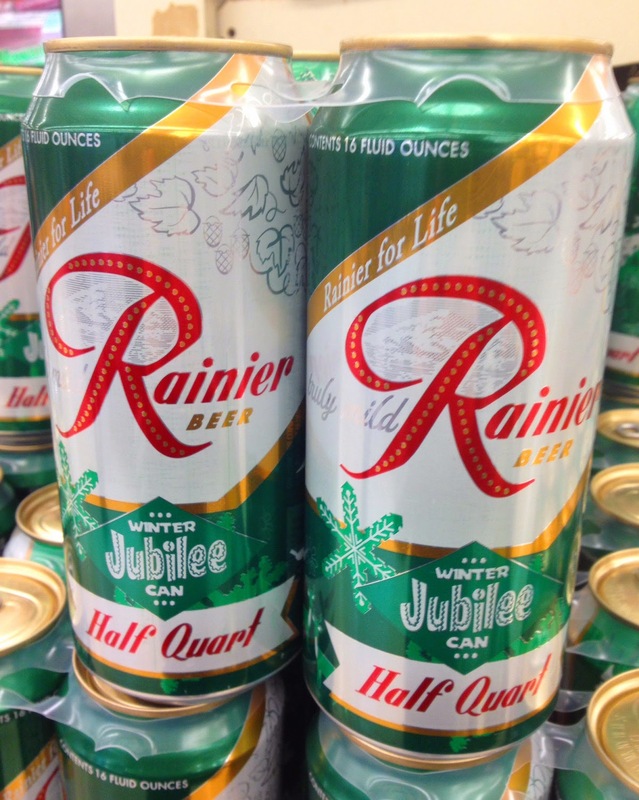 Because the only thing special about Rainier Jubilee is the can. As with many things, you need to step back in time to track the origins of the Jubilee can. The Rainier Brewing Company, which exists today only as a brand owned by an international cartel, has deep roots in the Northwest dating back to 1884. Rainier had a solid following through much of the 20th century, propelled during the latter half of the century by some seriously creative ad campaigns. Things gradually unraveled for Rainier with the full-fledged arrival of the national brands beginning in the 1960s, as was the case with most regional brands. The brewery in Seattle closed in 1999 and production moved out of state. 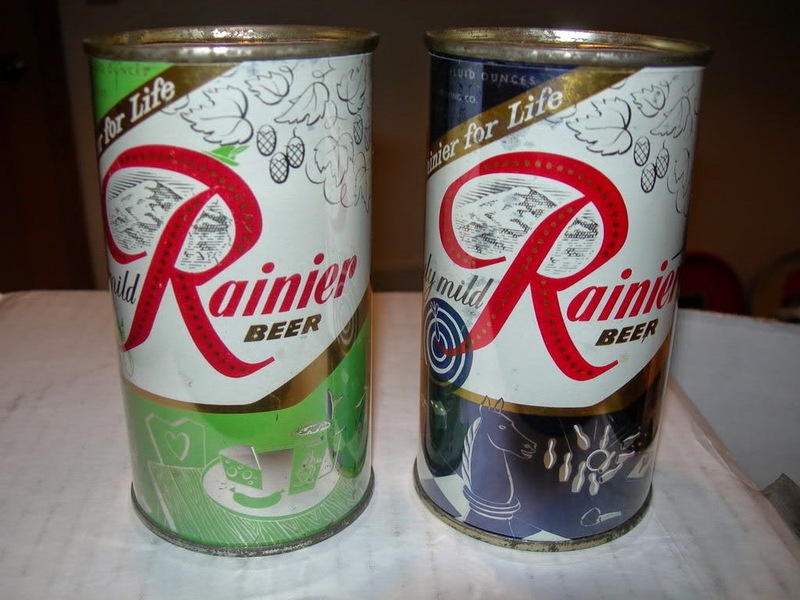 The original Jubilee cans appeared between 1952 and 1963, good years for Rainier. The holiday-themed cans became popular with collectors. It seems there were different themes each year and they appeal to collectors because they were produced in limited quantities. They were discontinued after 1963 and did not reappear until last year. The modern version of the Jubilee can emerged last October as Rainier celebrated restoration of the historic "R" atop the old brewery. There's no longer a brewery of any kind there, but never mind. This was a symbolic celebration of what Rainier once meant to Seattle. A good crowd turned out to party it up for R Day. Fast forward to October 2014 and another R Day celebration. And a newly revised can. The artwork continues to borrow slogans, typography and themes from the past. The primary color tone switches from last year's powder blue to a hunter green motif this year. Fans of the standard Rainier can need not fear. The white cans will return after the holidays. 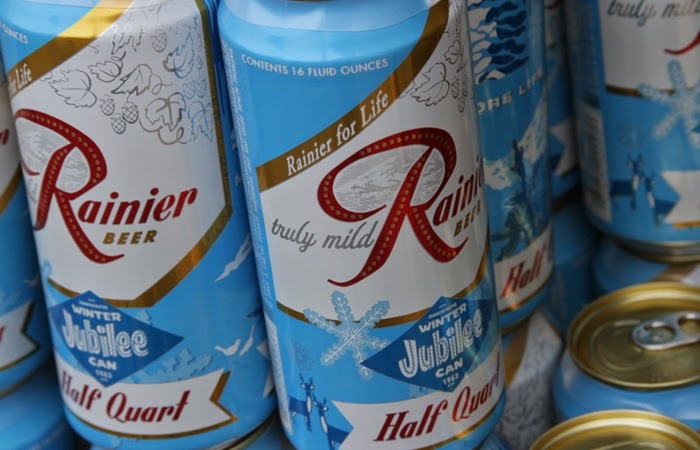 Statements from Rainier officials suggest the cans are part of maintaining the integrity of the brand. And you know that's what they're doing because they aren't messing with the time-proven Rainier recipe that so many know and love. So grab a six-pack if you must. Just know the only thing special is the can.